No recipe today, but an honest testimony. But before I begin, I want to remind everyone that I am not a doctor and that this post is in no way meant to incite anyone to stop taking medication prescribed by their physician. Four years ago, after we went to see a chiropractor for a knee problem, we started a gluten-free and dairy-free diet. We followed the diet very strictly, not out of conviction, but rather « to prove the lady wrong » as my husband said to me in the car. She had noticed his unusually swollen eyelids, face and abdomen. At the time, my husband suffered from multiple allergies : pollens, dust mites, dog hair, cat hair. His eyes were watery, and itchy all year-round, winter, summer, nothing made a difference. About twenty years before, he had been diagnosed as being asthmatic, was under medication and never went anywhere without his inhaler, which he needed morning and night, not counting the times when he had an attack, like after mowing the lawn. In addition, he was found to have glaucoma for which had to take eye drops twice a day, at specific intervals, which was very inconvenient when we travelled overseas and crossed time zones. Well, four years ago, after three weeks of this gluten and dairy-free diet, we had our first surprise : for the very first time in over twenty years, that evening my husband found himself breathing better and declared he had no need for his spray ! In the days and weeks that followed, and after hours spent researching and many meals testing this food and that, we finally realized that on top of gluten and dairy, sulfites and additives as a general rule were the cause of his health problems. What joy to be able to go for walks and to garden without having to worry about allergies – or the sleepless nights that followed ! We talked about it with our family doctor, who said he wasn’t too surprised and declared that many of us « dig our own grave with our teeth ». To be completely honest, the asthma bit hasn’t completely gone away ; it is not that easy to fully recover after your gut flora has been tampered with. But, as an example, over the past six months, my husband has only needed his inhaler three times ; yes, 3 times instead of 360 ! He can’t really get off his « diet », and he is definitely sensitive to things such as wood fire and city pollution (diesel fumes especially). Along with the allergies, another ailment that has disappeared from his life is migraines, which we used to attribute to changes in the atmospheric pressure ! Let me get to the glaucoma part now. Last year, out of curiosity, knowing that we would be spending a few weeks in the U.S. with our children, my husband asked his ophtalmologist if his treatment was to be taken for life. The doctor checked his eye pressure and offered to try going without his drops for three weeks, then six months, under his supervision. His eye pressure was checked every time, then again last Monday… No more glaucoma ! We were of course delighted but somewhat perplex : how could we explain this improvement ? I was quite aware that our change in diet could not be its direct cause. Then, on a hunch I took out the information leaflet accompanying the corticoid medication he had been prescribed as a long-term treatment for his asthma and that he hasn’t taken at all in the past three years. There, in black and white, was our answer : glaucoma is listed as one of the undesirable, though rare, side effects. 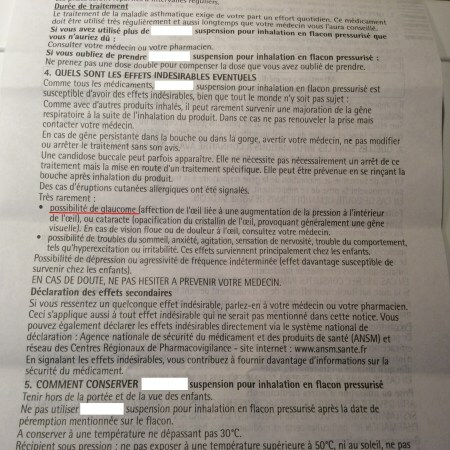 The leaflet I photographed is in French but it is not hard to guess the meaning of what I underlined. With this post, I wanted to tell you why food is now at the heart of our good health ; we have apparently entered a « virtuous circle », and are doing our best to stay in it ! Dear neighbors, as well as occasional readers of this blog, whoever you are, please take care of yourselves by using natural, unprocessed (and preferably organic) produce as a base for your cooking ; your body will thank you ! I know many of you are already on the same page, so let us all spread the good word ! Very well put. I’ve never heard the expression: “Dig our own grave with our teeth”, I like that. I might steal it one day. I really glad to see someone else who sorted their various health problems out by eating better, it really is amazing all that poor eating can cause, isn’t it? It’s a wonderful thing you’ve done in putting this story out there, no doubt there’ll be countess neighbours who can relate and find help within it. Take care, dear neighbour. Thank you for commenting. Your own experience is pretty amazing. Today’s industrial food is hurting so many people. I listened to this excellent documentary on YouTube while gardening last week (and listening was better than watching for me, as I can get distracted by the pictures). The video was made by Jamie Oliver and it’s about sugar. I was appalled to learn how many people in Britain get amputated every week because of diabetes. He also talks about how young children now have to deal with serious health issues. This is all so wrong.